Greece and the Greek islands is one of the most unique and popular destinations for diving holidays and travel in Europe. With the crystal blue waters of the Aegean and Ionian seas, Greece is just as beautiful underwater as it is above. On the seabed of Greek waters, you will find a spectacular array of colours, fauna, wildlife and also a variety of ship wreaks. There is so much beauty and inspiration below the sea, that it really has to be experienced first hand to be appreciated. The clear waters provide divers with the chance to enjoy scuba diving with excellent visual conditions. Weather permitting, visitors can enjoy scuba diving excursions throughout the year. Whether you are an experienced diver, or a complete amateur, you will be able to enjoy a wonderful diving experience in Greece. There are many diving clubs and schools located through Greece and the Greek islands that can cater for all levels of diver. If you are serious about scuba diving, there are many diving clubs that offer lessons for all levels of certifcation. With highly experienced instructors and the unique waters of the Greek seas, your certification programmes will be both very rewarding and enjoyable. Many of the scuba diving clubs in Greece will also be able to rent our equipment for experienced divers who are holidaying in Greece, but who have not brought their own equipment with them. Below you will find information about some of the various diving schools and clubs that you will find around Greece and the Greek islands. The beautiful island of Santorini, surrounded by the crystal blue waters of the Aegean is an extremely popular destination for scuba diving holidays in Greece. 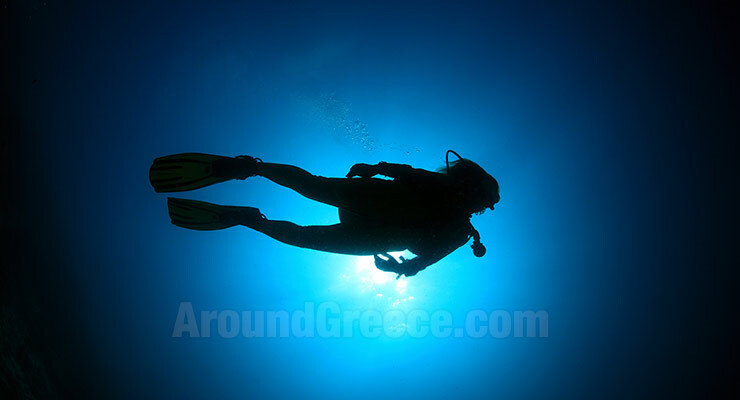 Aegean Divers offer a wide range of different diving options and have something for all levels of diver. The Petries Divers School which is located in the region of Petries in Southern Evia, offer a range of different diving courses, as well as organised diving excursions for you to explore the waters around this beautiful Greek island.